Kuala Lumpur Convention Centre (KLCC), Malaysia. 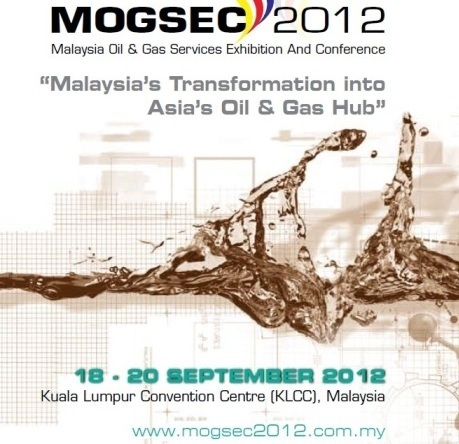 MOGSC (Malaysian Oil & Gas Services Council) will be organising the inaugural MOGSEC 2012 (Malaysia Oil & Gas Services Exhibition and Conference) from 18-20 September 2012 in the Kuala Lumpur Convention Centre (KLCC). This event will present an excellent platform for the Malaysian Oil & Gas service providers to showcase their capabilities and expertise. The organisation of MOGSEC 2012 is in line with MOGSC’s mission to promote the services sector of the Malaysia Oil & Gas Industry and also serves to complement efforts initiated by the Government, to promote the Oil & Gas sector as the main driver for the country’s economy through the Economic Transformation Program (ETP). MOGSC will be working hand in hand with the Malaysia Petroleum Resource Corporation (MPRC), as agency under the Prime Minister’s Department with an ultimate vision to develop the Nation’s Oil & Gas industry to be a greater level in this region. We will be working closely with Malaysian Exhibition Services Sdn Bhd as the Exhibition Manager in the organisation of MOGSEC 2012, whose top-notch reputation has been cemented through their highly acclaimed OGA (Oil & Gas Asia) series of exhibitions. Therefore your participation in this Malaysia’s prestigious Oil & Gas event would surely be beneficial in making your organisation as the frontrunner in the Oil & Gas industry in this region. This event aimed to make Malaysia as the Regional hub for Oil & Gas which will attract major international players to Malaysia and at the same time promote local industry champions. - Strategic and comprehensive business matching programs. - Enhance the image of your company, trademark, quality and services. - To analyse the new market trend. - A better understanding of market situation through direct feedback from your audience and direct contact with your clients. - Strengthen relationship with current clients and conquer new ones. - Establishing contacts for new business opportunities. - Direct observation of competitor offerings. - Launch new products for a bigger impact on the market. WHO SHOULD / WILL BE VISITING? - Individual and organisation involved in Upstream, Midstream and Downstream businesses should/ will visit the exhibition. The process of searching for, the recovery and production of crude oil and natural gas as well as potential underground or underwater Oil & Gas fields. It also includes auxiliary services such as logistic, automation, instrumentations, equipment and many related products and services. The processing, storing, markets and transporting crude oil, natural gas, Natural Gas Liquids (NGLs) and Liquefied Natural Gas (LNG). Area of oil refineries, petrochemical plants, petroleum products distribution, retail outlets and natural gas distribution companies.